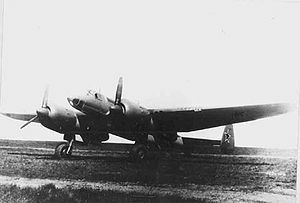 Sukhoi Su-8 or DDBSh (- Twin-engine two-seat armored ground attack aircraft) was a Soviet prototype heavy attack aircraft of the German-Soviet War. While Sukhoi was perfecting the light Sukhoi Su-6 attack aircraft, the OKB also developed the massive, heavily armed and armored Su-8. Two prototypes were completed in 1943 and underwent factory testing in 1944, but did not advance to government trials or production due to the unavailability of M-71 engines. An attempt to re-engine the aircraft with Mikulin AM-42 engines did not see further development. The Su-8 was of mixed construction. The cockpit area was armoured, with an aluminum mid-fuselage and a wooden monocoque tail. The wings were of steel and aluminum construction with plywood outer sections. The twin rudders were of all-metal construction. In addition to the cockpit, the engines, the fuel tanks and the oil coolers were fully armoured, with a total armour weight of 1,680 kg (3,705 lb), more than twice as heavy as the armour shell on an Ilyushin Il-2.